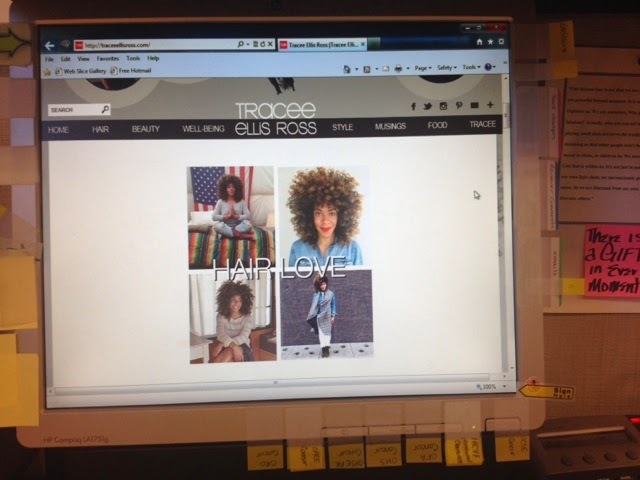 April 10, 2014 by RockYoRizos in "Ecostyler gel", "Refinery29", "TraceeEllisRoss", "curly essence", "dark and lovely", "sebastian potion 9", "women"
So I was sitting at my desk preparing some documents to give to my boss for review and my phone would not stop vibrating. I have it set for just emails and phone calls- the rest of my notifications are off so I'm not distracted. I look down at my phone and noticed a considerable amount of texts from my amigas but I found it odd because it was the middle of the day (12:46pm to be exact). 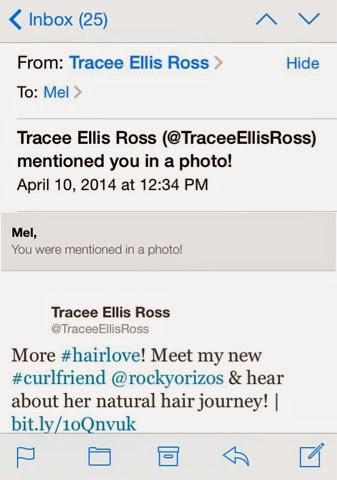 As I slid the grid of my iphone, I noticed a tweet from Tracee Ellis Ross. Now, I absolutely LOVE and admire this woman. I mean I have spent hours of my weekends on the sofa with popcorn watching Girlfriends and taking mental notes of her dope outfits and hairstyles. Ok ok, back to the point - I am a TOTAL novice to Twitter and I don't understand it at all. So, I check my twitter notifications to see what was written and this comes up. I finally got around to my texts (at this point I was shaking) to read all of the amazing and heartfelt texts my friends wrote - LOVE you guys! Now with all that being said, I just have to say THANK YOU to Tracee Ellis Ross. I know everyone has a story but thank you for reading and sharing mine. *A SUPER BIG GRACIAS to my curlsisters Ana and Denise from Curly Essence for writing such a great article. I am so humbled! "Ecostyler gel", "Refinery29", "TraceeEllisRoss", "curly essence", "dark and lovely", "sebastian potion 9", "women"
March 11, 2014 by RockYoRizos in "Ecostyler gel", "american apparel", "curly hair", "dark and lovely", "softsheen carson", "women"
For the most part, you all know that I LOVE the Dark and Lovely Au Naturale anti-shrinkage line. So when I found out they were launching the anti-breakage products, I was suppppper excited to try it. So here we go - below is 8 day dirty pelo. Condition/Detangle: Dark and Lovely Au Naturale anti-breakage Strength Restoring conditioner. Finger combed hair from ends to root and rinsed with cold water. Style: Coated hair with Dark and Lovely Au Naturale anti-breakage Root to Tip mender and then applied Ecostyler styling gel. Diffused hair for 9 minutes on low heat. I really enjoyed trying out the products. The hair wash definitely lived up to its name - the rizos were definitely squeaky clean. I would use the conditioner consistently because I really liked the slip of it and it was significantly easier to detangle. I can also use it as a deep conditioner as mentioned on the label - Score! I would have to try using a lesser amount of the root to tip mender so my hair won't feel weighed down. I recommend these products. I have not been disappointed with Dark and Lovely products and the best part is they do not cost a fortune! "Ecostyler gel", "american apparel", "curly hair", "dark and lovely", "softsheen carson", "women"
March 02, 2014 by RockYoRizos in "curly hair", "dark and lovely", "natural hair", "new york"
I was invited to celebrate the launch of Dark and Lovely's New Au Naturale Anti-Breakage line at the New York hotspot No. 8. Try to imagine a room full of gorgeous women (and some men) with beautiful, flowing, lustrous manes. From long to short hair and loose ringlets to fabulous up-do's. It was TOTAL sensory overload - I think I'm still suffering from whiplash, LOL! Also, there was a special performance by Marsha Ambrosius and the delicious food was provided by Chef Roblé. "curly hair", "dark and lovely", "natural hair", "new york"
January 29, 2014 by RockYoRizos in "curly hair", "dark and lovely", "natural hair", "softsheen carson", "washington DC"
No shrinkage makes us HAPPY! "curly hair", "dark and lovely", "natural hair", "softsheen carson", "washington DC"
September 19, 2013 by RockYoRizos in "Ecostyler gel", "dark and lovely", "sebastian potion 9", "wash yo rizos"
Condition/Detangle: Dark and Lovely Au Naturale anti-shrinkage Knot-Out Conditioner Finger combed hair from ends to root and rinsed with cold water. Style: Coated hair with Sebastian Potion 9 wearable styling treatment and then applied Ecostyler styling gel. Seal: Dark and Lovely Au Naturale anti-shrinkage Sheen Sealing Nectar. Sprayed 2x in hand and worked the product evenly from the ends and to the roots in the back of hair - it is driest part of my hair. I must say this is the best 1st day hair I have had in a long time! The significant difference I noticed in using the Beyond Gentle and Sulfate Free wash was that my hair was easier to detangle and it was not as dry as when using the Hydrating Soak Shampoo. I also noticed more of the "anti shrinkage" benefits which was a huge plus for me. As for the Sheen Sealing Nectar Spray, I really enjoyed it! It smells absolutely amazing but I would not use it as a spray because a little goes a long way - which is why I sprayed it in my hands to apply. "Ecostyler gel", "dark and lovely", "sebastian potion 9", "wash yo rizos"
September 12, 2013 by RockYoRizos in "dark and lovely", "kids", "shea moisture", "washington DC"
Zoë was up to something..
Uncle Sheldon came and Zoë started a handstand contest! and Uncle Sheldon got a "A" for effort! "dark and lovely", "kids", "shea moisture", "washington DC"
August 11, 2013 by RockYoRizos in "dark and lovely", "ecostyler", "sebastian potion 9", "wash yo rizos"
If you have ran across or follow me on Instagram (@rock_yo_rizos), I used to post my routine there but I figured posting it here is sooooo much easier on the eyes Hahaha! Any who, today is the dreaded day of washing my hair. I know you curly haired folks know exactly what I am talking about. Urrrrrrrrgh! Below is 8 days dirty hair. Gross I know... but check it out! Diffused hair for 15 minutes on low heat. I swear by the Dark and Lovely Au Naturale Line! Not only does it smell absolutely amazing (it contains mango oil and bamboo milk- Yum!!) but I don't experience much shrinkage after my wash which is a huge plus for me and the conditioner is extremely hydrating. I totally recommend trying it! "dark and lovely", "ecostyler", "sebastian potion 9", "wash yo rizos"